Hard to believe, but it's already been three years since Slotland launched its second online casino! Three years ago tomorrow, WinADayCasino.com, a casino unlike anything online slots players had ever seen, took its first cash bet. There were only a handful of games back then but like today they were all completely unique, created by WinADay, and not available at any other online casino. Since then a lot more incredible slot machines and video poker games have been created and the lobby has been re-designed several times to accommodate the growing selection. One thing that hasn’t changed, though, is the company’s dedication to customer service. 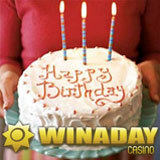 Good things come in threes as WinADay celebrates with some special birthday deposit bonuses. Everyone that logs on tomorrow will find they’ve received a birthday present -- $33 deposited in their account (VIP players will receive $66.) Players can also get up to three deposit bonuses tomorrow, June 23rd -- a 100% cash back bonus will be paid on players’ 3rd, 6th and 9th deposit. (The usual wagering requirements for bonuses apply and are posted on the site.) The birthday blitz continues Friday and Saturday June 24 & 25 with 33% bonuses on every single deposit. Horoscopes say anyone born June 23rd will “be actively involved with teamwork and collaboration with others” this year. In WinADay’s case, the stars are no doubt referring to its in-house team of games designers who will continue to add amazing, unique games. The next new one is an “America” themed online slot machine that will launch shortly. WinADayCasino.com is a no download casino with 25 one-of-a-kind online casino games - online slot machines, video poker, roulette and keno. Most of the slots are tied to one progressive jackpot which was recently hit for $167,648. Currently nearly $200,000 the jackpot is quickly approaching last year’s record breaking $224,420 jackpot win. If you've played at WinADayCasino.com please use the comment box below to tell other players about your experience there!